Sophie Caplan receives a certificate of appreciation from Rieke Nash for her long association with AJGS. 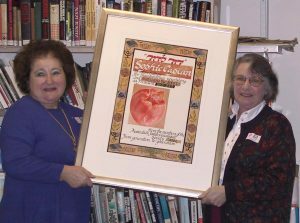 AJGS founding member, past president and life member Sophie Caplan passed away peacefully on Saturday January 20, 2018. Sophie was a towering figure in Australian Jewish genealogy and many of our members have fond memories of her efforts in building our society into the vibrant organisation it is today. We would love for you to share your memories of Sophie in the comment section below. We will pass these on to Sophie’s family.